This weekend brought another crazy Saturday. I sat on my couch after my morning quiet time, my head spinning as I thought of everything I had to do - grocery shopping, cleaning, laundry, college work, studying, writing, finishing my children's church lesson. By 7:30 a.m. I was already overwhelmed! Then I decided to finally read the email I'd been saving - Ann Voskamp's blog posts from the week, the ones I hadn't had time to read during the craziness of college classes and work and washing towels and cooking dinner. And I found her wonderful "Sanity Manifesto." I felt a little sanity creeping in just reading her post. It was exactly what this stressed out, about-to-graduate momma needed. If you haven't read this - go read it now. Are you incorporating any of these ideas into your routine? On a side note - your prayers would be appreciated. This semester is intense as I balance school, seeing patients, work, family, home, church, and studying for national boards. It's a lot to juggle - but on May 10, it's all going to pay off. Chasing a God-sized dream is a scary thing! I've discovered that over and over since I started chasing mine, first with dental hygiene school, and now with writing. I find myself facing emotions ranging from excitement to doubt to outright terror. I found this on Pinterest a few days ago. It sums up what I feel perfectly - I'm scared to death! This week, I've taken a couple of small steps toward my goal. The first is just writing. I've written some blog posts and put a total of about six hundred words into my big project, as well as doing some polishing on the first few chapters. Step two is getting my first two chapters ready to go to my critique group. This small group of ladies (along with with my amazing friend and editor, who is getting a slightly larger piece of the story) will the be the first people to read anything more than just snippets of my writing. It's the first day of a new semester - my last semester of dental hygiene school. I should be feeling pretty good, but I'm not. Balance is nowhere in sight for me right now. I'm still playing catch up from Christmas, an out-of-state funeral, and a three day conference. I'm reeling from the past two weeks, and I'm starting the semester (again) exactly where I said I wouldn't - exhausted, teary-eyed and overwhelmed. I may not be able to control what happens in life, but I can control how I respond to it and how prepared I am for it. Want to join me? 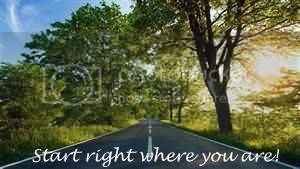 Leave a comment telling me how you're starting to change things right where you're at. I was born a dreamer - a kid with my head in the clouds and a huge imagination, dreaming of a world of adventure that was always just around the corner. I spent hours imagining every detail of how things would turn out. For a while, I would see myself as an archaeologist...then a teacher...then a vet...but under it all, never wavering, ran one dream - writing. Whatever else I saw myself doing, in my mind, I was always writing about it. As it so often goes in life, though, I grew up and my dreams changed. I started college, met the love of my life, and lived my fairy tale - love, marriage, and motherhood. As my boys started to grow up, I chased a new dream, one which will be complete in May when I graduate as a registered dental hygienist. I dream of a great career, financial stability, and the chance to make a difference through medical missions trips. But buried beneath it all, pushed aside and covered in dust, the same dream hid - writing. I dabbled with it for years, satisfying the need to write with journaling and blogging. A year ago, things started getting more serious, more focused. As I drew closer to God, He slowly began to reveal His big dreams for me...and to my surprise and joy, He dusted off that long abandoned dream of writing...to be more specific, writing fiction. The first few steps were so terrifying it took my breath away. Panic almost overwhelmed me as I posted my first fiction link-up, under a pen name, to Write On Edge - and shock silenced me as good reviews and feedback came in. So I posted again...and again...and suddenly, a whole new side of me was materializing. Characters and ideas that I'd dreamed of for years suddenly started coming alive on my laptop screen. I found myself talking to other writers online, getting feedback, and even joining a critique group. In just a few months, this dream has become such a part of me that I know there's no going back. My dream of writing has become firmly planted in my mind. It's no longer just a general, random dream - it has a title, characters that I've been planning for years finally coming to life, twists and turns and subplots. It even has sequels - I have more ideas following the same characters. This is, without a doubt, the most terrifying thing I have ever done. 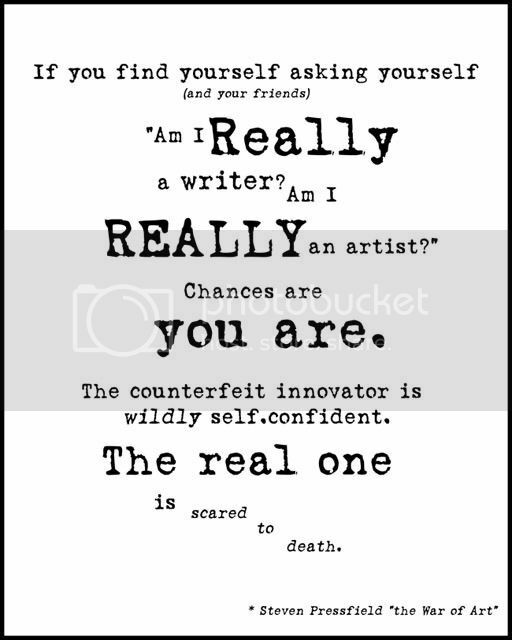 I can't count the times I've figured out just the right wording, written an intense scene, or poured my heart and soul into a piece, then looked up and silently asked, "Are you sure about this?" And He said yes. He's given me God-sized dreams, and I'm going to follow them with everything I have - because that's what He made me for. Over the last year, as I drew closer to God, He spoke to me about dreams. He planted big dreams - God-sized dreams - in my heart, and He reawakened dreams that I had long ago let die. As I've prayed for direction and conformation, He has sent it. Although these dreams sometimes leaving me shaking in my boots, I know I'm headed in the right direction, and I'm excited about working toward those goals this year. 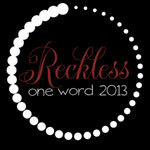 On Monday, I'll share on Must Love God about why I chose "reckless" as my resolution for the year. It's fits perfectly with the dreams God has planted in my heart, though. However, as I mentioned, this year hasn't started quite like I expected. On Sunday night, my husband's precious 86 year old grandmother went home to be with Jesus. As soon the funeral ends, I have to make a long drive to Dallas for a three-day review for the Dental Hygiene National Boards. Its going to be a long week for all of us, and your prayers would be appreciated.